Made of 600D Polyester - Water Resistant, Beyond Durable Bag for College! College textbooks, notebooks, binders, college laptops, writing utensils, calculator...those are a few of the college supplies that you will need to take with you to every college class. It sounds like a lot, and it is. Plus college textbooks are pretty large and you'll be carrying a few of them. If you're picturing yourself with all those dorm items in your arms, chances are you're thinking about how much your arms would hurt. And don't forget about your back. You don't want to hurt your back carrying heavy college textbooks to and from class every day. 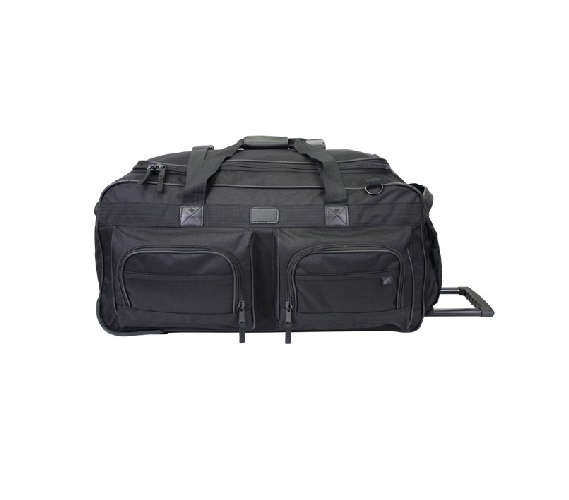 A dorm essential you can't go to college without is our Travel Wagon College Backpack. Our Travel Wagon College Backpack will prevent you from hurting your back and arms - it has wheels and an extendable pull handle so you can simply load up your college backpack and never have to worry about picking up the heavy weight! Worried about the durability of this dorm necessity? You shouldn't be! It's made of 600D Polyester which is a super tough fabric that is going to be incredibly durable to withstand tough college use. And if it rains you don't have to worry about your valuable dorm laptop and smartphone getting soaked - this college backpack is also water resistant!